A rhythmical swaying of the hips to the pulsating rhythm of Sega music; such was the scene that greeted coaches, officials and players alike as they received a warm welcome in Port Louis, Mauritius on Monday 3rd September. 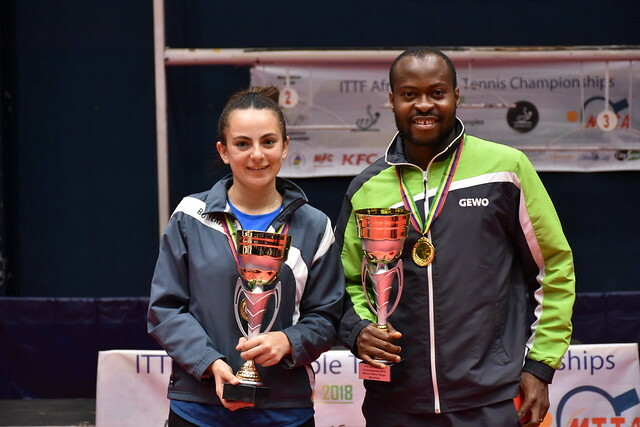 The colourful Opening Ceremony signalled the start of the 2018 ITTF African Championships. Present for the occasion was Thomas Weikert, ITTF President alongside Steve Dainton, ITTF Chief Executive Officer, Alaa Meshref, ITTF Executive Vice President and Khaled El-Salhy, the President of the African Table Tennis Federation. Likewise, Jean Christophe Stephan, Mauritius Minister of Youth and Sports attended, as did Vimal Basanta Lala, the President of Mauritius Table Tennis Association and Philippe Hao Thyn Voon Ha Shun the President, Mauritius Olympic Committee. Gown flowing Sega Dancers, a dance which originated from the ritual music of Madagascar and the mainland of Africa ignited proceedings; it is the musical expression of the Mauritian way of life, joy and liveliness. A true feel of the traditions of Mauritius was witnessed. Welcoming delegates and teams, Vimal Basanta Lala, described hosting the tournament as a unique honour for Mauritius; he thanked the International Table Tennis Federation and the African Table Tennis Federation for their support in making the staging of the African showpiece a reality. He urged the world table tennis ruling body to help in their efforts to build a table tennis training centre in the island, the first in Sub-Sahara Africa. Meanwhile, Philippe Hao Thyn Voon Ha Shun applauded the International Table Tennis Federation for upholding good governance and their vision to develop the sport in Africa. Similarly, Khaled El-Salhy described Mauritius as a good host, being renowned for their warm hospitality which continues to attract tourists to the Island. He thanked the Mauritius government for their support in hosting the tournament. Equally, there were positive words from Thomas Weikert; he commended the efforts of the Mauritius Table Tennis Association for staging the tournament, reaffirming support for Africa. Concluding the speeches, Jean Christophe Stephan thanked the International Table Tennis Federation for considering the country as the tournament’s hosts, whilst also pledging government support for table tennis. He congratulated the Mauritius Table Tennis Association for their vision in developing the sport. Matters concluded with a ceremonial table tennis match between Jean Christophe Stephan and Thomas Weikert.